As we move into 2015 Formula 1 season’s last few races Lewis Hamilton is favourite to win his third world title which will put him 5th on the all time table alongside Jack Brabham, Aryton Senna, Jackie Stewart, Nicky Luada and Nelson Piquet while only four drivers has won more than three world titles with Michael Schumacher first on the all time list with 7 world titles, Argentinian Juan Manuel Fangio has won 5 while Alan Prost and Sebastian Vettel both have 4 titles each. So where do Lewis Hamilton rank in terms of greatest Formula 1 drivers of all time ? Well lets assume he will win his third title this year and recently signed a contract extension with Mercedez and he is only 30 year old so have enough time to potentially add a couple more titles which will elevate him right up there with the very best. But for now he alongside, Fernando Alonso and Vettel are the only current drivers who can make it to the top 10 list of greatest F1 drivers of all times. We take a look at some of the greatest F1 drivers in history but first let see who won the most world titles in Formula 1. But Who Was The Greatest ? 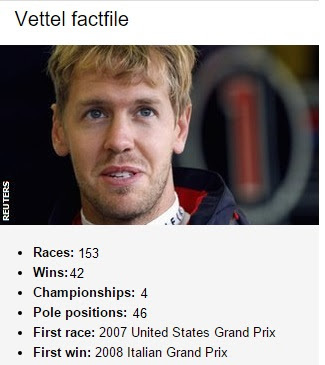 The above statistics dont do justice for some of the achievment made by the drivers throughout the F1 history. 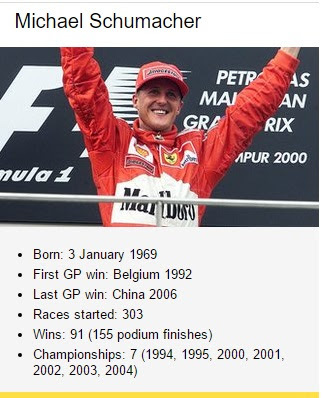 Statistically speaking Michael Schumacher comes out on top with 7 world titles including 5 consecutive with Ferrari and 2 with Benetton-Ford but Aryton Senna had a such an impact on the sport that many believe he was the not only the most talented but also the greatest Formula 1 driver of all times. Lets run through the list and briefly some great names in Formula 1. 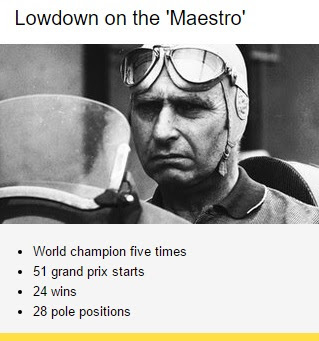 The greatest not only in terms of statistics but also the impact on the F1 history, Fangio was so talented he made driving an art. His victory in the 1957 German Grand Prix was the prime example of him not only being a champion but a true world class driver who could take himself and the car to absolute limit. 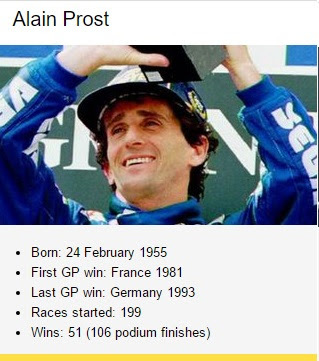 He was widely regarded as “El Maestro” and his percentage of grand prix wins stands at 46.15% which is still the best. He started 52 grand prix and won 24. 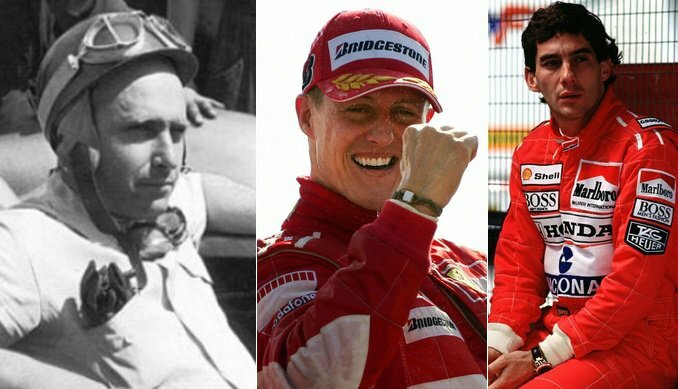 It really is a toss between Schumacher and Fangio for the greatest driver of all times eventhough Schumacher is the most successful driver of all times with 91 grand prix wins in 303 race starts and he won 7 world titles two more than Fangio. Schumacher started the career with Jordan-Ford back in 1991 belgian grand prix when first team driver Bertrand Gachot got injured. He never looked back after that with disputes of teams fighting to sign him. 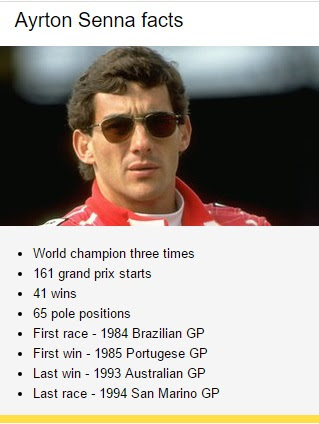 He won his first world championship title in 1994 the same year when Aryton Senna died in the crash. After defending his title in 1995 with Benetton Schumacher moved to Ferrari and won 5 back to back titles from 2000 to 2004. The brazilian had raw talent, un-parallel determination and that nasty streak in him which made him fan favourite and probably the most loved F1 driver in the history of sport. He started the career with team toleman in 1984 before moving to Lotus in 1985 where he spent three years. His move to McLaren was highly successful for him and the team where he won three titles in 4 years (1988, 1990 and 1991) McLaren were no longer competitive in final years of Senna contract and he moved to Williams in 1994 but his career was ended when Senna tragically died in 1994 San Marino grand prix accident. But he left behind a legacy which will be hard for any driver to surpass. Although he won four world titles of his own he was over shadowed by the sheer speed and charisma of Aryton Senna in what is widely regarded as one of the greatest rivalry in not only in Formula 1 but sports in general. If Aryton Senna was charismatic, fearless and probably more talented Prost was more of a poet on circuit with his calculated approach pushed Senna to limits. Looking at the grand prix win percentage tells a different story with Prost having slightly better ratio and if we regard Senna as one of the greatest drivers Prost name has to be alongside him no matter what. Often experts and fans play down achievement of current sport heros compared to the past legends and Vettel is one prime example of such stupidity. He won four back to back titles with Red Bull Renault and became the youngest driver to win the world title. Ferrari signed him up with one of the most expensive contracts in formula 1 history where he was paid around $50 million in his first year of the contract why ? because he is not only talented but he extracted results from that talent as well. His 2015 Formula 1 season is his first year with Ferrai and although Mercedez cars are clearly faster than the rest he kind of matched them throughout the season and might pip Nico Rosberg in second place with Hamilton is likely to win 2015 world title. Ferrari had issues but Vettel has been pretty good winning three races so far in the season and we safely assume he will come stronger in next season and with age (28) on his side he still has chance to eclipse Fangio’s 5 world title and match Schumacher’s 7 title record. Alonso is Spanish not English !